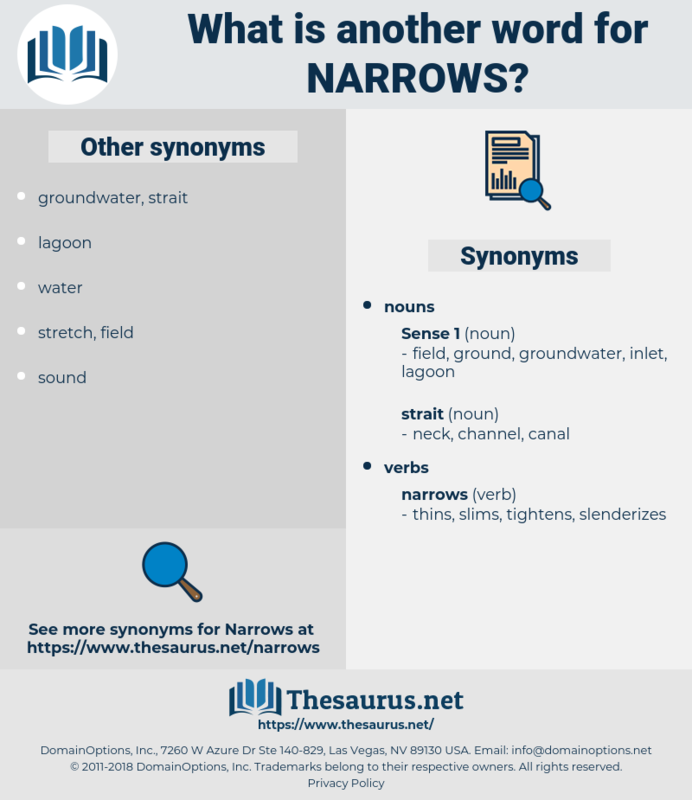 What is another word for Narrows? downgrade, downgrades, low, LOWS, decreased, transition, weaker, dwindling, conversion, changeover, cutting, declining, graduation, transit, shrink, slowdown, Slows, flat, disappoint, Declined, dropped, passage, safelane, slipping, passing, falling, retreat, down, decline, declines, drags, sliding, slashes, trim, trims, pare, ease, eases, falls, way, drift, drop, drops, sag, sink, sinks, pares, Plays, fades, skid, dive, slip, slips, pass, fall, stumble, stumbles, Dives, dip, dips, slump, slumps, slide, slides, plunge, plunges, fell, shift, tumble, tumbles. decreases, drifts, sags, plummets, LOWS, declines, falls, drops, sinks, fades, slips, fall, Dives, dips, slumps, slides. transformation, partitioning, doorway, passageway, right-of-way, switchover, overpass, handover, progression, fraction, sojourn, switching, portion, sidewalk, stretch, quotation, beachhead, move, walkway, route, corridor, movement, bridge, gateway, sabbatical, hallway, bulkhead, lane, rollover, extract, pathway, path, onslaught, inlet, phrase, suspense, alley, pass-mark, hatch, airplay, switch, fare, leap, lapse, excerpt, stint, bit, visit, run, take-up, transition, conversion, changeover, transit, passage, passing, way, pass, shift. constrains, diminishes, restricts, reconsiders, circumscribes, restrains, weakens, confines, minimises, wanes, minimizes, curtails, limit, limited, limits, shrinks, reaches, impairs, lessens, crossings, decrements, recedes, mitigates, erodes, hinders, relieves, collapses, retreats, depresses, hampers, suppresses, decreases, belittles, inhibits, reverses, OPTS, revises, undermines, qualifies, Backs, drifts, sags, plummets, pulls, passes, crossing, transition, Slows, retreat, down, declines, drags, slashes, trims, eases, falls, drops, sinks, pares, Plays, slips, fall, Dives, dip, dips, slumps, slides, plunges, tumbles. They were favored with moderate, fair winds, and though the little vessel was uncomfortably crowded, she made a quick passage and stole in through the Narrows as dusk was closing down one tranquil evening. At the foot of the bay it suddenly contracts, and winds through a crooked passage called the narrows, and again opens and forms a small bay directly above the falls. 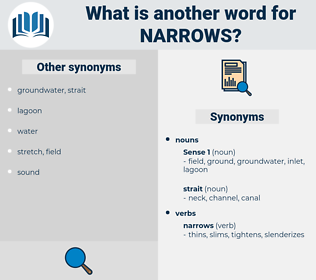 near, ne'er, newari, norway, nmr, NRA, nowhere, no more, nero, nunnery, nauru, naira, nonhairy, noria, nehru, namer, niner, NRO, nary, New Year, nearer, namur, NARA.